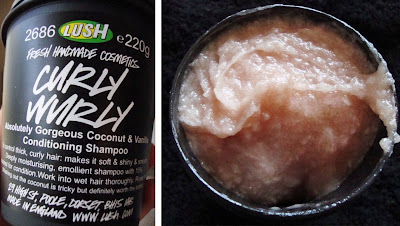 B U B B L E G A R M: Lush 'Big' and 'Curly Wurly' Shampoo Review! 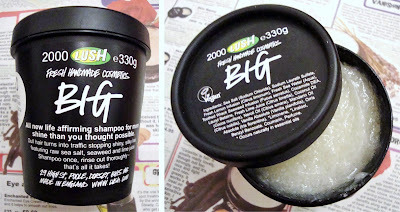 Lush 'Big' and 'Curly Wurly' Shampoo Review! I have been using 'Big' for a few months now, I can safely say it does add volume and make your hair "big" like it claims to whilst adding shine. However, I found that if you continue to use it, it doesn't work as well as it did when you first tried it and it can also be REALLY drying. It is a really clarifying shampoo, meaning it does strip some of the colour from your hair as it contains sea salt. If you have just dyed your hair darker and want to lighten it, this would be a great alternative to using an anti dandruff shampoo. I think that this shampoo would work wonders on natural hair colour without damage, saying that... I STILL love it and would continue to repurchase but not use it as regularly. With this in mind, on my previous Lush trip - I explained my problem and the sales assistant recommended 'Curly Wurly' which I have been using for about a month. According to Lush, Curly Wurly is to control thick curly hair. My hair is thick but not 'curly' more like straight with dreaded kinks. I was assured that any hair type that was dry could use it as it's a conditioning shampoo with coconut and vanilla. Curly Wurly does make your hair softer without drying it out. However, the coconut chunks are a bit hard to wash out. The only problem with this is that if you use it too often it can make your hair greasy quicker. Have you tried these shampoos? If so, what do you think and what are your favourite Lush shampoos? Strange u shuld post this. I brought CW jst this am after ure comment in tag post.lookin 4ward 2 trying it! I like Retread conditioner+ave also tried a couple of pre-shampoo treatments+they worked v.well but I cant afford to use them every time I wash my hair. I'm curious about the solid shampoo bars but cos of my exts, they are a no go@ moment. The range i am loving most is the aussie range it makes my hair super soft & shines like no other i have used before. Doesn't leave it dry nor make it greasy which i love. Thanks for the review, it was very helpful. I was looking at both of these when I was in LUSH last week and was considering trying one of them, but wanted to see more reviews before I picked which one and this was helpful. I think I may try the Curly Wurly! I use both of these, and enjoy them for pretty much the same reasons. Yes, it takes a little longer to get the coconut pieces out of my hair, but it's easily solved by rinsing longer. Sometimes, I think the CW actually volumizes my hair more than Big! I love both Big and Curlywurly. I used to work at Lush, and through my haircare training was told that these shampoos were both best used as once a week/twice a week etc not for everyday use. I love big, curly hair. Thanks for the reviews! oh wow mixing the two would be a perfect idea :) thanks for the review hun! @essjay23x I agree, I havent tried a full size retread yet, but veganise and american dream were a bit meh! @Jody yes curly wurly def requires a lot of effort and wouldnt be great if you were in a rush! @dreams that glitter fantastic, I like to wash my hair every other day, using big everyday would be CRAZY! I have Cynthia Sylvia Stout shampooand I absoultely adore it. Imo it smells amazing....lemony and earthy. It has one sulphate but no SLS so have not noticed colour fade. Also found my hair lasts longer between washes and is uber soft. Definately recommend! !